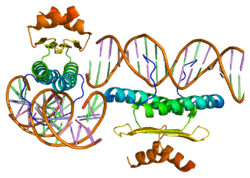 Myocyte enhancer binding factor 2B (MEF2B) is a transcription factor part of the MEF2 gene family including MEF2A, MEF2C, and MEF2D. However, MEF2B is distant from the other three branches of MEF2 genes as it lacks the protein-coding Holliday junction recognition protein C-terminal (HJURP_C) region in vertebrates. The MEF2 gene family is expressed in muscle-specific gene activation and maintenance during development. MEF2B mRNA is present in skeletal, smooth, brain and heart muscles. MEF2B is directly involved in smooth muscle myosin heavy chain (SMHC) gene regulation. Overexpression of MEF2B will activate the SMHC promoter in smooth muscle when it is bound to the A/T-rich element of the promoter. MEF2B has been shown to interact with CABIN1. Recurrent mutations in this gene have been associated with cases of diffuse large B-cell lymphoma. In its mutated form, MEF2B can lead to deregulation of the proto-oncogene BCL6 expression in diffuse large B-cell lymphomas (DLBCL). Mutations of MEF2B enhance its transcriptional activity due to either a disruption with its corepressor CABIN1 or causing the gene to become insensitive to inhibitory signaling events. ↑ Krenács, Dóra; Borbényi, Zita; Bedekovics, Judit; Méhes, Gábor; Bagdi, Enikő; Krenács, László (2015-09-01). "Pattern of MEF2B expression in lymphoid tissues and in malignant lymphomas". Virchows Archiv: An International Journal of Pathology. 467 (3): 345–355. doi:10.1007/s00428-015-1796-6. ISSN 1432-2307. PMID 26089142. ↑ Rodríguez, Andrés I.; Csányi, Gábor; Ranayhossaini, Daniel J.; Feck, Douglas M.; Blose, Kory J.; Assatourian, Lillian; Vorp, David A.; Pagano, Patrick J. (2015-02-01). "MEF2B-Nox1 signaling is critical for stretch-induced phenotypic modulation of vascular smooth muscle cells". Arteriosclerosis, Thrombosis, and Vascular Biology. 35 (2): 430–438. doi:10.1161/ATVBAHA.114.304936. ISSN 1524-4636. PMC 4409426 . PMID 25550204. 1 2 Wu, Wenwu; de Folter, Stefan; Shen, Xia; Zhang, Wenqian; Tao, Shiheng (2011-01-01). "Vertebrate paralogous MEF2 genes: origin, conservation, and evolution". PloS One. 6 (3): e17334. doi:10.1371/journal.pone.0017334. ISSN 1932-6203. PMC 3048864 . PMID 21394201. ↑ Buchberger, A.; Arnold, H. H. (1999-06-01). "The MADS domain containing transcription factor cMef2a is expressed in heart and skeletal muscle during embryonic chick development". Development Genes and Evolution. 209 (6): 376–381. doi:10.1007/s004270050267. ISSN 0949-944X. PMID 10370120. 1 2 Katoh, Y.; Molkentin, J. D.; Dave, V.; Olson, E. N.; Periasamy, M. (1998-01-16). "MEF2B is a component of a smooth muscle-specific complex that binds an A/T-rich element important for smooth muscle myosin heavy chain gene expression". The Journal of Biological Chemistry. 273 (3): 1511–1518. doi:10.1074/jbc.273.3.1511. ISSN 0021-9258. PMID 9430690. ↑ Han A, Pan F, Stroud JC, Youn HD, Liu JO, Chen L (Apr 2003). "Sequence-specific recruitment of transcriptional co-repressor Cabin1 by myocyte enhancer factor-2". Nature. 422 (6933): 730–4. doi:10.1038/nature01555. PMID 12700764. ↑ Morin RD, Mendez-Lago M, Mungall AJ, Goya R, Mungall KL, Corbett RD, et al. (Aug 2011). "Frequent mutation of histone-modifying genes in non-Hodgkin lymphoma". Nature. 476 (7360): 298–303. doi:10.1038/nature10351. PMC 3210554 . PMID 21796119. ↑ Lohr JG, Stojanov P, Lawrence MS, Auclair D, Chapuy B, Sougnez C, et al. (Mar 2012). "Discovery and prioritization of somatic mutations in diffuse large B-cell lymphoma (DLBCL) by whole-exome sequencing". Proceedings of the National Academy of Sciences of the United States of America. 109 (10): 3879–84. doi:10.1073/pnas.1121343109. PMC 3309757 . PMID 22343534. 1 2 Ying, Carol Y.; Dominguez-Sola, David; Fabi, Melissa; Lorenz, Ivo C.; Hussein, Shafinaz; Bansal, Mukesh; Califano, Andrea; Pasqualucci, Laura; Basso, Katia (2013-10-01). "MEF2B mutations lead to deregulated expression of the oncogene BCL6 in diffuse large B cell lymphoma". Nature Immunology. 14 (10): 1084–1092. doi:10.1038/ni.2688. ISSN 1529-2916. PMC 3954820 . PMID 23974956. Yu YT, Breitbart RE, Smoot LB, Lee Y, Mahdavi V, Nadal-Ginard B (Sep 1992). "Human myocyte-specific enhancer factor 2 comprises a group of tissue-restricted MADS box transcription factors". Genes & Development. 6 (9): 1783–98. doi:10.1101/gad.6.9.1783. PMID 1516833. Pollock R, Treisman R (Dec 1991). "Human SRF-related proteins: DNA-binding properties and potential regulatory targets". Genes & Development. 5 (12A): 2327–41. doi:10.1101/gad.5.12a.2327. PMID 1748287. Katoh Y, Molkentin JD, Dave V, Olson EN, Periasamy M (Jan 1998). "MEF2B is a component of a smooth muscle-specific complex that binds an A/T-rich element important for smooth muscle myosin heavy chain gene expression". The Journal of Biological Chemistry. 273 (3): 1511–8. doi:10.1074/jbc.273.3.1511. PMID 9430690. Iida K, Hidaka K, Takeuchi M, Nakayama M, Yutani C, Mukai T, Morisaki T (Jan 1999). "Expression of MEF2 genes during human cardiac development". The Tohoku Journal of Experimental Medicine. 187 (1): 15–23. doi:10.1620/tjem.187.15. PMID 10458488. Youn HD, Sun L, Prywes R, Liu JO (Oct 1999). "Apoptosis of T cells mediated by Ca2+-induced release of the transcription factor MEF2". Science. 286 (5440): 790–3. doi:10.1126/science.286.5440.790. PMID 10531067. Li M, Linseman DA, Allen MP, Meintzer MK, Wang X, Laessig T, Wierman ME, Heidenreich KA (Sep 2001). "Myocyte enhancer factor 2A and 2D undergo phosphorylation and caspase-mediated degradation during apoptosis of rat cerebellar granule neurons". The Journal of Neuroscience. 21 (17): 6544–52. PMID 11517243. Han A, Pan F, Stroud JC, Youn HD, Liu JO, Chen L (Apr 2003). "Sequence-specific recruitment of transcriptional co-repressor Cabin1 by myocyte enhancer factor-2". Nature. 422 (6933): 730–4. doi:10.1038/nature01555. PMID 12700764. Konig S, Hinard V, Arnaudeau S, Holzer N, Potter G, Bader CR, Bernheim L (Jul 2004). "Membrane hyperpolarization triggers myogenin and myocyte enhancer factor-2 expression during human myoblast differentiation". The Journal of Biological Chemistry. 279 (27): 28187–96. doi:10.1074/jbc.M313932200. PMID 15084602. Han A, He J, Wu Y, Liu JO, Chen L (Jan 2005). "Mechanism of recruitment of class II histone deacetylases by myocyte enhancer factor-2". Journal of Molecular Biology. 345 (1): 91–102. doi:10.1016/j.jmb.2004.10.033. PMID 15567413. Gong X, Tsai SW, Yan B, Rubin LP (2006). "Cooperation between MEF2 and PPARgamma in human intestinal beta,beta-carotene 15,15'-monooxygenase gene expression". BMC Molecular Biology. 7: 7. doi:10.1186/1471-2199-7-7. PMC 1526748 . PMID 16504037.